The first leg of our South American honeymoon took us to Rio de Janeiro, where we spent a few days letting the city's mesmerizing colors, textures, tastes, and sounds wash over us. It was my first time traveling to Brazil, and Rio was unlike any place I've ever visited. I couldn't get over its enchanting, jewel-like setting, with densely populated urban areas nestled between verdant slopes rising sharply from the coastline. Add the fact that it's bathed in golden sunshine by day, and cooled by a gentle fog that rolls in towards evening, and you pretty much have a recipe for a magical atmosphere. 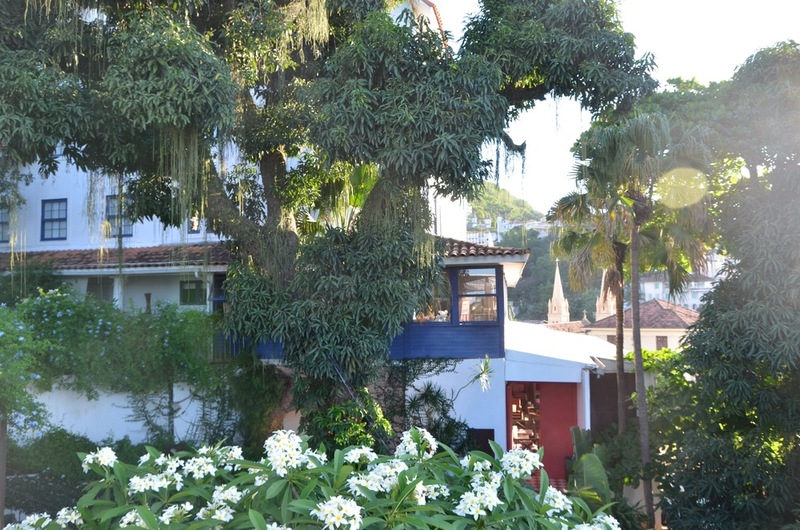 Our home base was the beautiful Hotel Santa Teresa in Santa Teresa, a charming neighborhood of winding cobblestone streets set in the hills overlooking the city, far from the Miami-esque vibe of Copacabana and Ipanema. Wending our way along the streets, we encountered beauty at every turn, with curious forms of unruly flora spilling over walls or erupting from crevices in the most random of places. Charming cafes with beautiful tile work and kitschy decor brimmed with locals and tourists alike. Known for its quirky, bohemian vibe, Santa Teresa has a creative culture that's very respectful and supportive of artists. We experienced this firsthand during our dinners there, as storytellers and poets would wander into restaurants in search of an audience. In New York, unsolicited visits of this sort might be considered intrusive, but in Santa Teresa, they were welcome, and everyone paused to give the performers their undivided attention, parting with change and small bills when the hat made its way around. Hotel Santa Teresa was a dream, decorated in a Brazilian modernist-meets-colonial style and chock full of Sergio Rodrigues classics (their website really doesn't do it justice). Samba music emanated from the poolside bar, beckoning us to take a dip and dry off with a nap in the sun. After checking in, we explored the beautiful grounds, where the landscape design struck the perfect balance between carefully tended and overgrown, before wandering up into the hills to take in sweeping city views. Since it was Thanksgiving day, we decided to enjoy a decadent spread at Aprazível, a delightful treehouse restaurant. Looking out at the twinkling lights of the city pulsing below, we gave thanks for what was shaping up to be a lovely adventure. For the next few days, we started our mornings with delicious acai bowls and pao de queijo at nearby Cafecito, (I ate pao de queijo several times a day, at every possible opportunity) and explored Rio's lush park spaces, lingering for hours at the Jardim Botânico and Parque Lage. Though we avoided Ipanema and Copacabana for the most part, we did swing by Ipanema beach to watch impossibly tan Brazilians play volleyball. We checked out some art (including a fantastic Yayoi Kusama retrospecive at the Centro Cultural Banco do Brasil), and managed to fit in a couple of touristy activities as well, taking the funicular up to Pão de Açúcar to catch the sunset over the city, and visiting the Cristo Redentor statue, which, sadly, was shrouded in fog, and damn near impossible to enjoy anyway with the throngs of tourists (a browse through a gift shop featuring Jesus figurines covered in day-glo velvet somewhat made up for this). We were quickly won over by the warm, friendly people we encountered and their laid-back, easy-going manner. I've never seen so many smiles in my life. Coming from New York, it was a shock to the system, in the best way. And though New York is quite diverse, Rio was on a whole different level. We quickly concluded that anyone could be Brazilian, as we saw pretty much every ethnicity represented. One of the most frequently asked questions we received from family and friends upon our return was regarding safety. My research prior to the trip wasn't very encouraging, with stories of taxi hijackings, hiker abductions, and beachgoers being robbed by child mobs (!) that appeared out of nowhere. However, the general consensus seemed to be that if we stayed alert and took the proper precautions, we would likely be fine. We were advised not to tote around cameras or valuables in public, so I left my handbag, wedding ring, and camera locked in a safe at the hotel. My husband kept a "decoy wallet" with small bills in it, and we tucked credit cards and additional cash inside our clothes. In lieu of our phones, we took an older iPhone with us when going out, so that we could pull up directions at cafes as needed. Sadly, this meant that other than a quick shot or two stealthily snapped on said old phone, we have very few photos of our time in Rio. I'd rather be safe than sorry, so no regrets. In short, if you're curious about Rio, please don't let safety concerns hold you back! We thoroughly enjoyed the lush environs and hilltop views at the Hotel Santa Teresa, but if you can splurge (or go with a large group), check out Chez Georges, a stunning architectural gem of a villa designed by Wladimir Alves de Souza. Modern Brazilian architecture! Catch an exhibit at the Instituto Moreira Salles and explore the grounds; If you have the time, make the trek to renowned landscape architect Roberto Burle Marx's former estate; Visit Casa das Canoas, the home Oscar Niemeyer designed for himself; take a side trip to Niterói to see the Niemeyer-designed Museu de Arte Contemporanea; take in the view of the city from Pão de Açúcar. 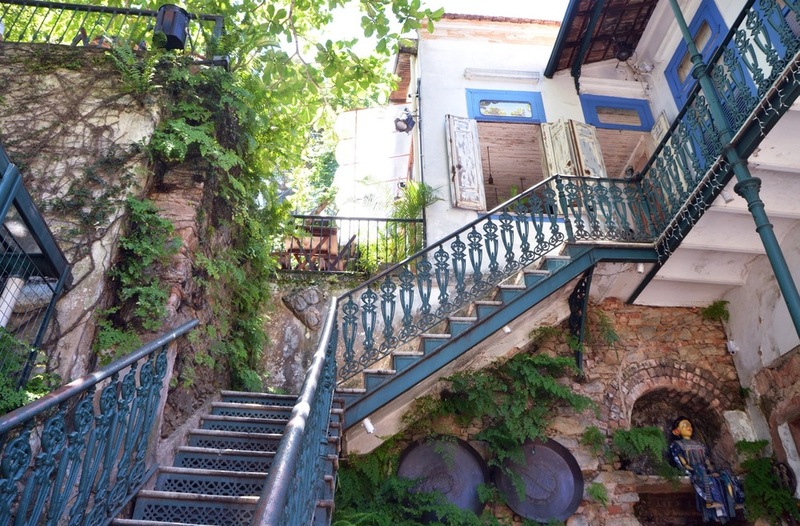 Explore the winding streets of Santa Teresa; Spot colorful, exotic birds at the Jardim Botânico and eat at the restaurant there (La Bicyclette); explore the lush grounds of the Parque Lage, check out the work of the art students, and enjoy a bite next to the lovely pool. Acai smoothies and pao de queijo at Cafecito; grab a bite at Iraja before bar hopping in Botafogo.